I recently visited London Curry House situated in Kumarapark, Bangalore, along with a friend. 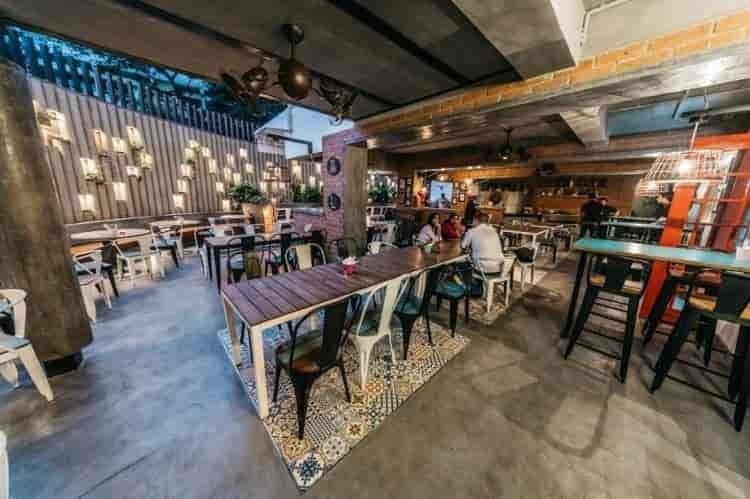 This is an upcoming casual/fine dining restaurant & is pretty popular among the city crowd in Bangalore. They have an extensive menu with dishes covering a variety of cuisines. Their food vibe is contemporary; traditional dishes are presented very creatively and in a fun way, with a very modern spin. An added highlight (for me 😀 ) is that this is a vegetarian restaurant ! The atmosphere is casual and relaxed. We visited on a weekend and it got pretty crowded and noisy, with families and big groups visiting for lunch. Overall, nice place to visit with friends or family. Outdoor seating is available. Service really could be better. Although prompt, they do not seem to readily accommodate requests for anything that is not part of the menu; when my friend asked for rice to be substituted in place of noodles in the sizzler, it was refused. When I asked for an extra plate of sauteed vegetables on the side, they said it could not be done. But when we said they could charge us for it if required, they acquiesced. Since weekends are usually quite busy at restaurants (we went at lunchtime on a Saturday), it is understandable that service needs to be quick. However, what was disappointing was that we were not allowed enough time to finish our starters; they insisted on serving the sizzlers when we were halfway through our starters, although we had pointedly requested them to serve main course after the starters were done. We had to call the manager and let him know that it wasn’t great to rush customers through their food. Finally, the bill took a while to arrive, even after reminders. What stands out in London Curry House, is the way food is plated and presented. Full marks for the utensils used, creativity in presenting, and the thought that has gone into the food pairing. Makes you want to just dive into the food when you see it! Smoked Pickle Flavored Paneer – which is an achari style paneer starter flavored with punjabi pickled spices, along with chunks of pineapple, capsicum, onion and sweet chilli sauce. This is served on a barbecue style grill, along with potato wedges and sauce. Utterly delicious starter, perfectly marinated in spices & everything cooked evenly. Pani Puri – this was your traditional pani puri served with 3 different fillings – namely yellow dal, moong sprouts, and potato/chickpeas masala. You get the usual mint-coriander flavored paani, along with the meetha (sweet) paani, which is made of tamarind and jaggery plus some spices. Although full marks can be awarded for presentation, the awe stops there. This dish was nothing spectacular in terms of taste; I’ve had way better pani puri in street side stalls, to be honest. So, I’d say it was an average dish at best. For my main, I chose the Patiala House sizzler – which consisted of piri piri flavored paneer pieces with sauce, with sauteed vegetables (broccoli, green beans, zucchini, carrots), desi biriyani and fried potato wedges. It comes with extra sauce on the side – which was a tomato based arabiatta style sauce, same as the one on the sizzler. The paneer was utterly soft and fresh, with the sauce being flavorful and rightly spiced. The desi biriyani was light and fantastic, without being too greasy. There were paneer chunks in the biryani as well, in addition to the sauce. It got overwhelming after a point (since we’d also had a paneer starter) so I had to leave some paneer on the plate. I ordered a small plate of sauteed veggies on the side, which was done nicely. The other sizzler my friend ordered was a Chinese one – called Chandni Chowk to China. It had vegetable manchurian balls that were wok-tossed with manchurian sauce, served with masala noodles and vegetables on the side. Portion sizes are really good and one person can share a sizzler easily. This sizzler was slightly greasy, but tasted really good; my friend couldn’t finish it though. We were too stuffed to even consider dessert ! They have a small pastry shop out front that lets you pack dessert if you want to. We paid about 2k and change for this meal, for 2 persons. Slightly on the expensive side, although portion sizes are really good and could easily serve 3. Some dishes like the pani puri do not feel like value for money. Overall, moderately good service, but good food at a slightly expensive charge. Do visit and let us know how you liked London Curry House!